Jaan Poldaas’s EG Series (1978), an investigation into the limits and possibilities of painting, evokes a crucial moment in recent art discourse when the critical potential of abstract painting appeared to be exhausted. While the predominant local practice of the time was predicated on painterly visuality and formalist values, the EG Series suggested an alternative – a conceptual model whereby representational issues could co-exist with abstract form. Poldaas’ work by the mid-seventies sought to engage the complex materiality of colour in a way which would avoid subjective taste, individual “touch’ and metaphoric associations. Rather, he aimed to establish an objective and rational criteria by which to critically examine the function of colour within painting. His critical approach to colour adapted conceptual art’s strategy of rational analysis and logic, bringing this to bear on the discourse of painting. 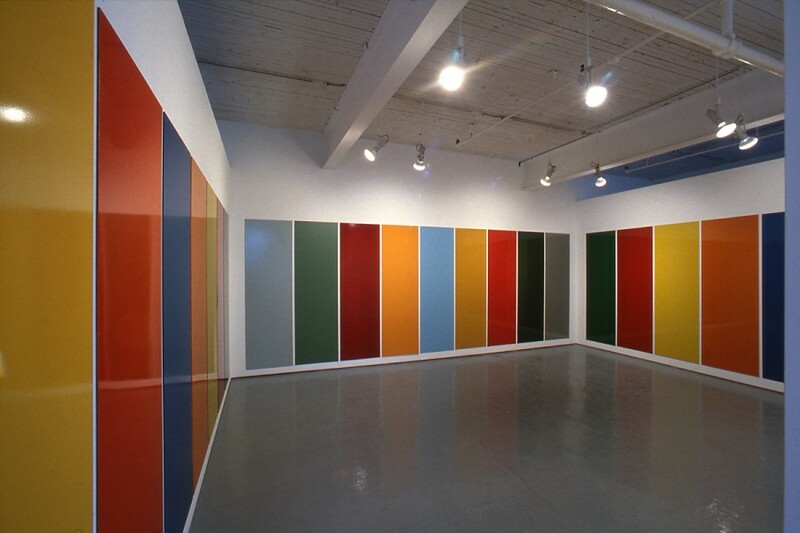 Poldaas interest, however, was not in conceptual art’s dematerialization of the art object, but rather was in dealing with the materiality of colour within a conceptual framework. Responding to a crisis within painting prompted by conceptual art’s insistence on functionalism – and language based criticality, Poldaas identified ways to address conceptualism’s critique of painting as a subjective and decorative commodity. 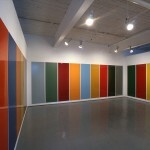 Poldaas’ first investigations were concerned with eliminating the particular idiosyncrasies of his own subjective response to colour. By choosing a preexisting commercial range of paint and combining then through a systematically defined matrix, he deflected the issue of individual choice and personal taste. 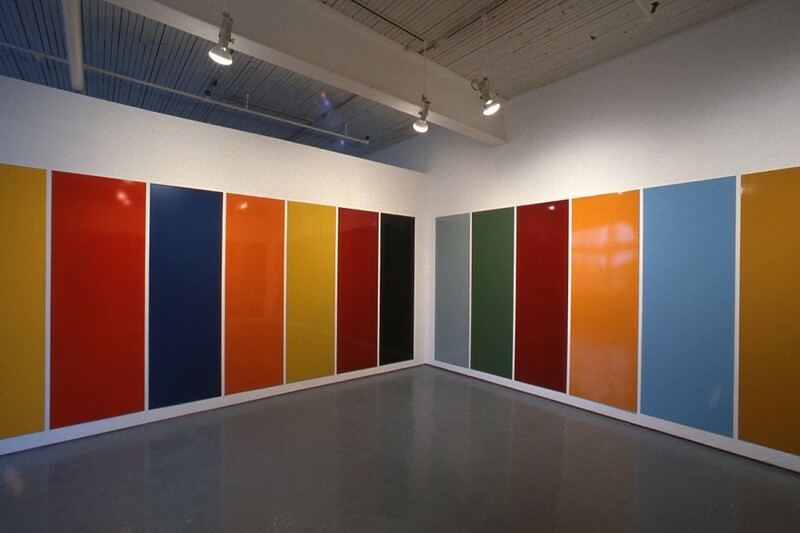 In the MSC Series (1974), ten Machine System Colourants (universal tinting pigments used for colouring all types of industrial and household paints) were constituted into a series by mixing equal parts of two individual colourants. All possible pairs of the ten original colourants were included in the matrix. 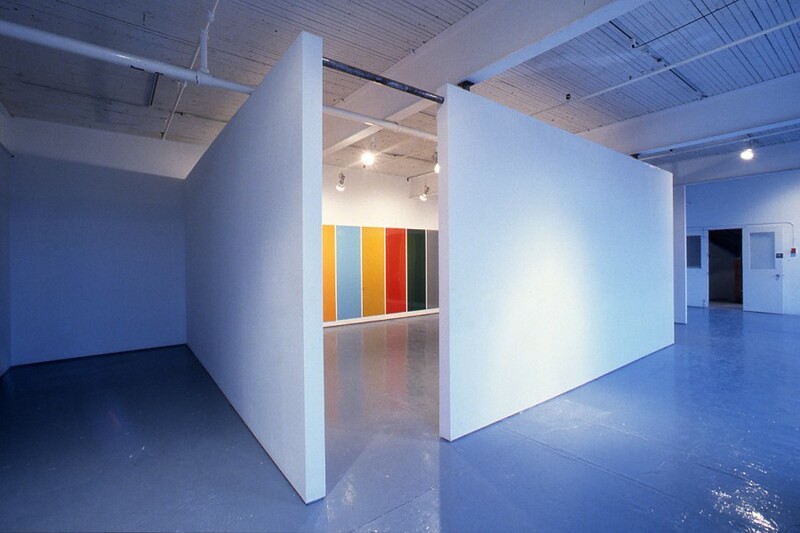 During the course of the work, a 48″ x 48′ masonite panel was painted in each colour of the matrix, while the selection and sequence of panels’ installation was determined by chance. Emphasizing the analysis of colour and process of selection, rather than the painting as a site of origination and authenticity, Poldaas also engaged an alternative system of distribution by sending books of the colour combinations to a number of well-known conceptual artists. 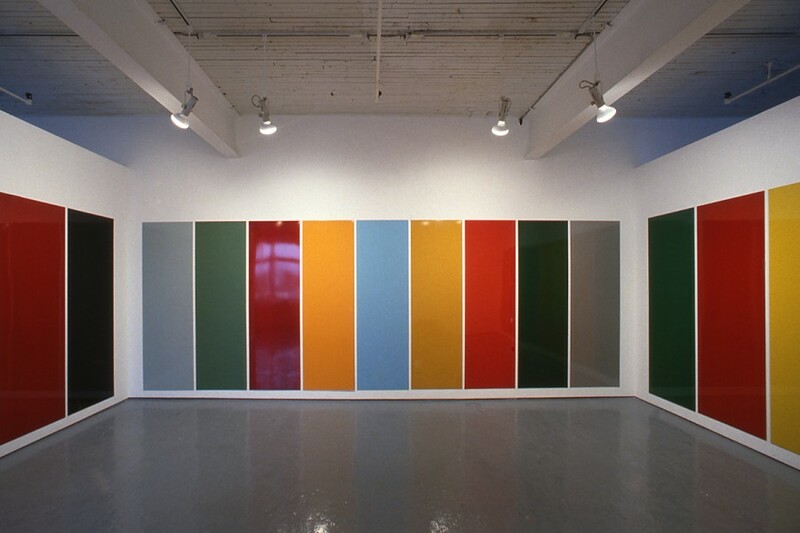 In another series, Work For Four Painters(1977) Poldaas invited three artists to participate in a programme whereby each artist chose a colour for one quadrant of twenty four paintings. 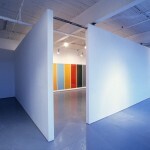 The four painters; Michael Balfe, Ric Evans, Robert McNealy and Jaan Poldaas, each selected one colour per painting, blind to the other participant s choices. This work attempted to avoid tasteful visual composition through its insistence on predetermined organization and process. While diminishing individual choice, association and reference inherent in the selection of colour, these series seem only to deflect the problematic aspects of personal choice through various systems of social collaboration in their production. The EG Series presents a more complex strategy, for unlike the hermetic, process oriented production of these earlier works, it examines idiosyncratic personal associations of colour in relation to broad social references shared by both artist and viewer. 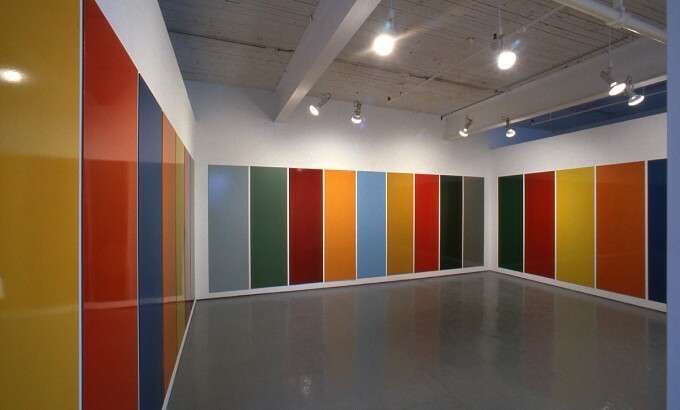 In this series, Poidaas selected specific colours from the urban environment which identified particular Toronto institutions or corporations and reproduced these colours on standardized panels. These monochromatic paintings isolated these colours from their source objects newspaper boxes, park benches, and school buses – and rematerialized them as paintings. The colours in the series include: Security Yellow after Metro Police, Green after Metro Parks, Red after the Toronto Fire Department, Blue after Via Rail, Red after Coca-Cola, Maroon after Toronto Hydro, Caterpillar Yellow after Yellow Cab, and Blue after the Toronto Star. 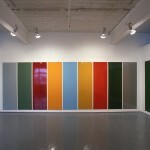 Painted on panels measuring two meters by two feet, approximating the size of small interior domestic doors, these colours were reframed in human proportions. 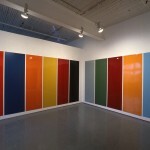 In each case, the method of paint application was identical to its original institutional use so that the panel representing the School Bus Yellow for instance was applied as a sprayed automotive enamel, while the Art Gallery of Ontario Crate Blue was latex applied with a brush. By displaying each of these colours in a standard format, the series presents them so that their resemblance to the object to which they refer is limited to a single material quality – a complex yet immediately recognizable system of colour codification. Importantly, it is not the autonomous materiality or formalist essence of paint which interests Poldaas in the EG Series but rather its ability to refer outside of its formal identity to the social and the quotidian. An equivalence of elements is produced through this standardized presentation which erases the particularities of form from the signified object; contrary to the way in which the objects are encountered in reality. This equivalence – a process of abstraction from the particular to the general – paradoxically allows the viewer to distinguish certain aspects of difference and examine the way in which colours are psychologically or culturally codified. This objectifying abstraction creates an explicit context for speculation on the usually implicit social operation of colour – which always functions in a representational manner, whether mimetically, metaphorically or allusionistically. In the EG Series Poldaas shows how, rather than forming some kind of exclusary binary the terms of abstraction and representation are part of the same complex cognitive operation. Unlike abstract painting that is predicated on reducing painting to its self-reflexive formalist elements, the EG Series creates a condition of abstraction in order to examine the mechanics of signification and association. By emphasizing the socializing function of colour rather than participating in a Modernist search for its essential qualities, Poldaas indicates the possibility for a recuperation of form from the restrictions of formalism. He suggests that even within the discourse of Modernist abstraction, the various qualities of a particular material (such as a monochromatic surface) may be read in the same way as other representational systems – as a codification of cultural and historical meaning.